We have TOTALLY fallen in love with this recipe, it is so delicious that I had to share it with you all. Its from Jamie Oliver’s book “Jamie Does…” and tastes so good that we’ve even taken to making the rice on its own to replace the times we have potatoes. The recipe below serves 4. Cut the tops off the tomatoes and put then to one side. Use a spoon to carefully hollow out the inside and get rid of that bit. Halve the peppers lenghtways, keeping the stalks intact. With a sharp knife and a spoon, carefully get rid of the seeds (if you could only find small peppers like us cut the tops off, like the tomatoes, but you may want to include a couple more peppers). Place all these vegetables into an appropriately sized deep sided oven dish. You want them to fit nice and snug. Toast the pistachios in a dry frying pan, keeping them moving so they don’t burn. When they’re done tip them into a pestle and mortar and roughly crush, then put them to one side. Add a glug of oil to the pan, put it back on a low heat and add the onions and garlic. Cook for about 10 minutes, until the onion is soft but not coloured. Add the rice, oregano, chilli and a good pinch of salt and pepper. Pour in half of the stock (300ml) and cook for around 7 to 10 minutes, stirring constantly, so the rice gets coated in everything and doesn’t stick to the pan. Remove from the heat and stir in the crumbled feta, fresh herbs and bashed up pistachios. 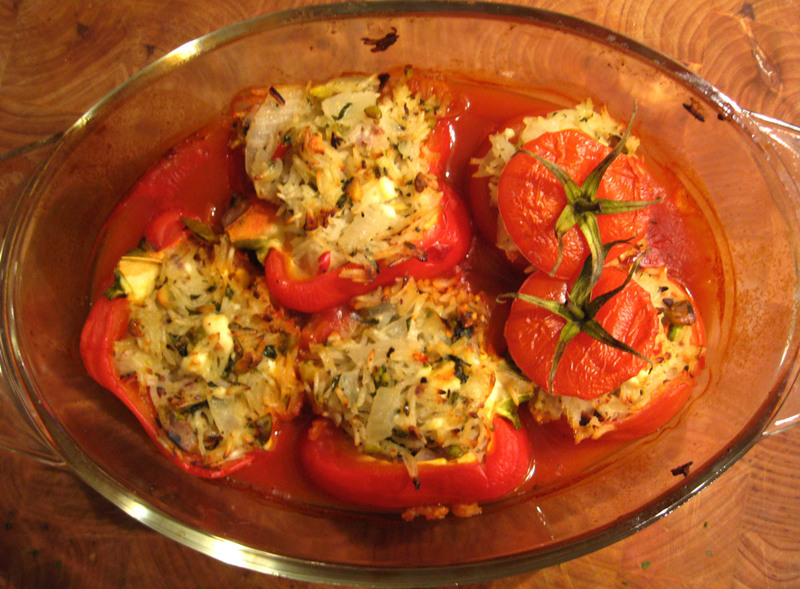 Carefully stuff the hollowed-out peppers and tomatoes with the hot rice mixture so it comes just to the top. Don’t over fill them as the rice will expand when it cooks. 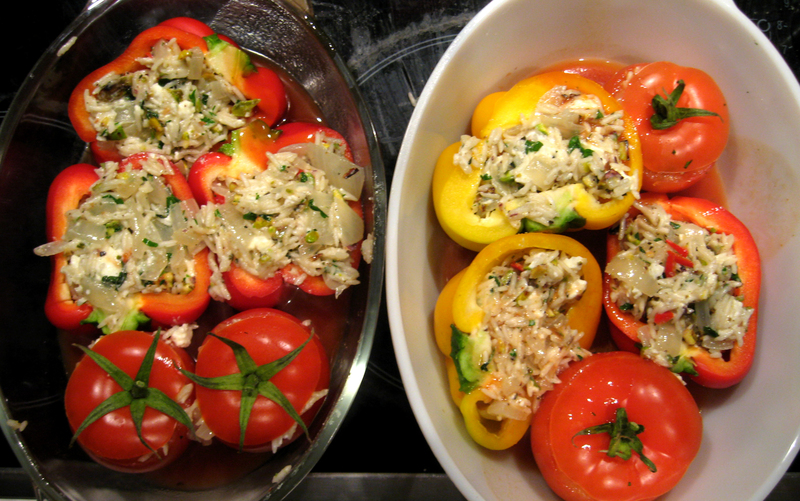 Put the tops back on the tomatoes and drizzle a few glugs of oil over the lot. Mix the tomato puree/paste with the remaining stock and pour into the baking dish, around, not over the veg. Cover tightly with kitchen foil and bake in the hot oven for around 1 hour and 15 minutes. Remove from the oven and transfer to serving plates. Serve straight away with some yummy salad and fresh crusty bread. Voila, the finished article! It may sound too tricky, but trust me it’s not, and all your hard work will be well worth it. 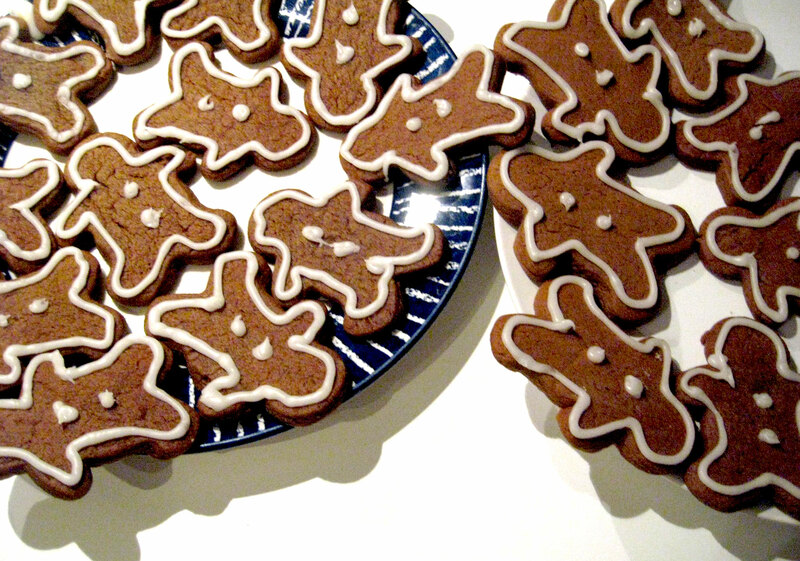 As a little Christmas treat I thought I’d let you all share this gingerbread recipe. Handed down to me through generations (well my stepmum via Delia), they’re easy to make and are a great last minute Christmas gift. Come on you needed something to do on Christmas Eve before you crack open the Baileys! 1. Here’s the slightly scary bit: put the sugar, golden syrup, treacle and 2 tablespoons of water to the boil, once it does, take it off the heat straight away. 4. Go and play Christmas games (you know… “Charades”, or “Who am I”) for 1 hour while the mixture cools. 5. Come back and preheat the oven to 180ºC. 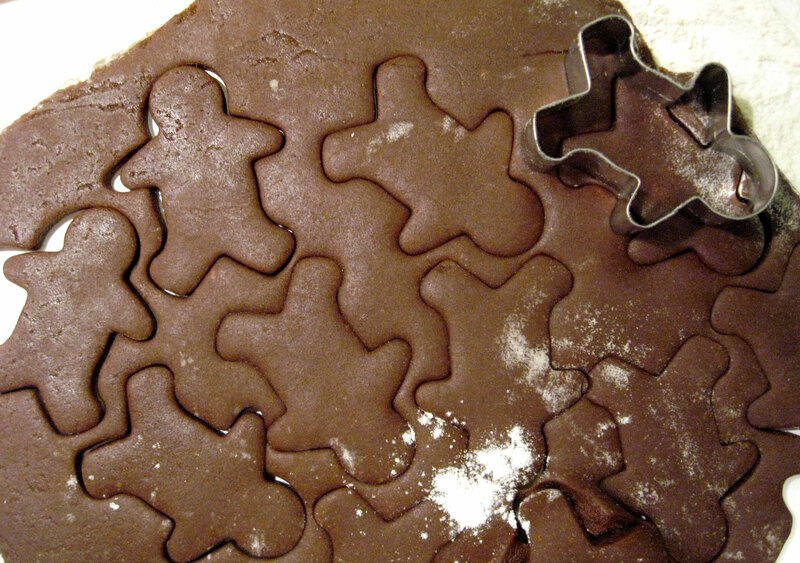 Roll out your mixture to about 1cm thick and cut it into lots of Christmassy shapes bake for 10-12 minutes. If you want you can ice them, or just eat them plain. My favourite way to have them is just out of the oven with a glass of cold milk. 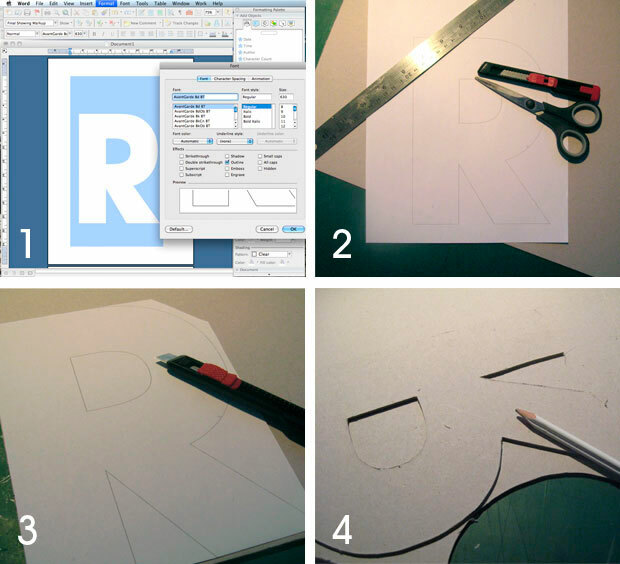 So back on the paper-cutting front, I said I’d let you know how this super-easy card making is done. 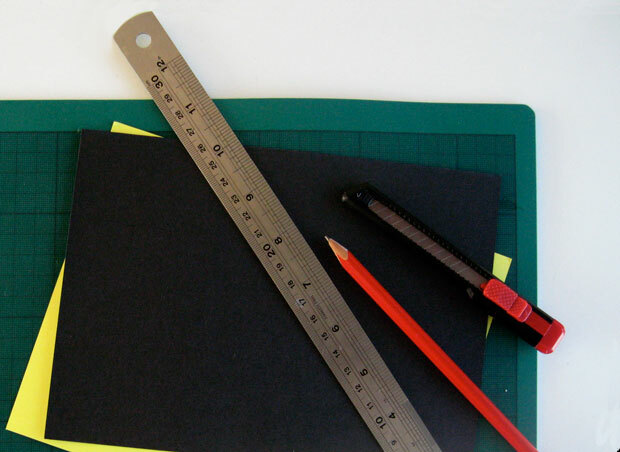 Firstly get your supplies; 2 pieces of thin, A5, different coloured card, a cutting mat, cutting knife, metal ruler (if you try cutting along a plastic one you’ll only succeed in cutting the ruler) a pencil and either some double sided tape or some pritt-stick. The piece of card you’re using as the main outer of your card is the one you want first. Fold it in half and smooth the edge. With the pencil and ruler mark out a 1cm border around the inside of the front page. 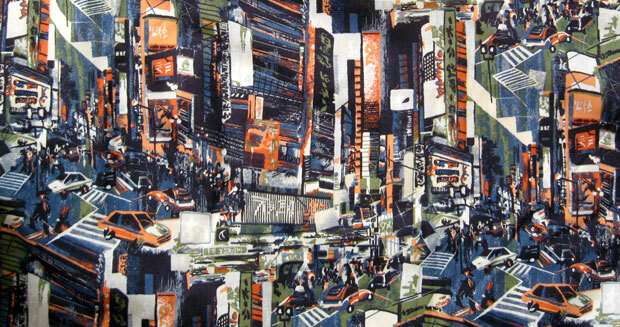 Within it is the area to do your design. In this example I’ve gone for simple lettering. Don’t forget to do it backwards! If you don’t feel you can freehand, use the magic tracing technique you learned at primary school. Get an image you like and trace over it in pencil, turn it over onto the paper you want to transfer to, hold it still and scribble over the back of it, works a dream for outlines (the old tricks are the best)! Now you want to cut out your letters, or image, the only thing you really need to remember is the the bits you want left in the picture have to be attached to the main frame of the card, so if you cut all the way round your “B” the inside arches will get lost. I’ve found there is no magic answer for how to best work it out, only simple trial and error. Once you’ve cut out and are happy with your image you want to fold your second piece of coloured card and stick it into the outer piece. Then I like to neaten up the outside edges with the metal ruler and cutting knife. It really is that simple! 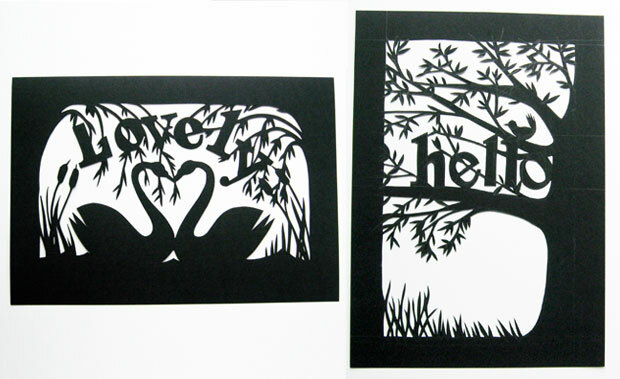 Here’s my finished card and another one to get you thinking of ideas (trees and birds are my favourite shapes!). Experiment, use images from magazines instead of the inside piece of card, cut crazy shapes and have fun with it. MIND those fingers and always use a sharp blade, this will stop you from snagging the card. Happy Friday everyone! So how about a nice little diy for the weekend. 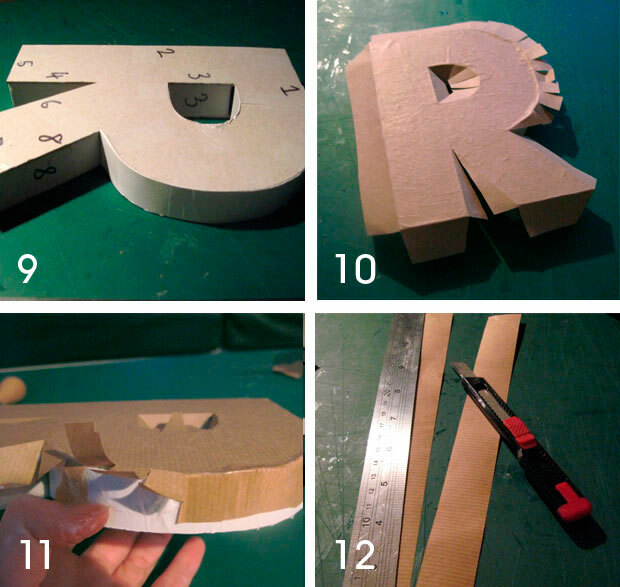 This time it’s for those ever-so-fashionable cardboard letters, except when you make them yourself you get to chose whatever font you please. It’s a pretty easy diy, maybe a little fiddly in places. 1. So first thing’s first, you’ve got to choose your letter. Open up Word and type in your letter, you want it pretty big, I’ve let mine fill up an entire A4 piece of paper. Choose the font you’d like your letter in. If they’re all a bit dull for your liking there are loads of free fonts to be downloaded online, try dafont (if you need to know how to load new fonts onto your machine find out here). If you don’t want to waste a load of printer ink you can go to format>font in the Word menu and switch it so it only colours the outline. Print out your letter. Here’s a tip: Start with a nice chunky font to begin with, it makes it a lot easier. 2. Lightly glue your paper letter to your card so it doesn’t move about too much as you cut it. 3. Cut your letter out. You can then pull the paper off. 4. 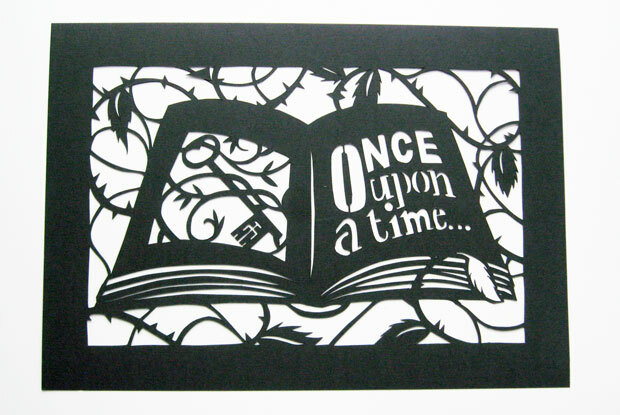 Take the letter you’ve just cut out, trace around it onto the card and cut out another copy of it. 5.&6. Next we want to start 3D-ifying it. Cut some strips of the grey board to the right lengths for your letter, I did mine a ruler width to make sure they were the same width each time. Then its a good idea to number which lengths go where, as they all start to look the same. 7. 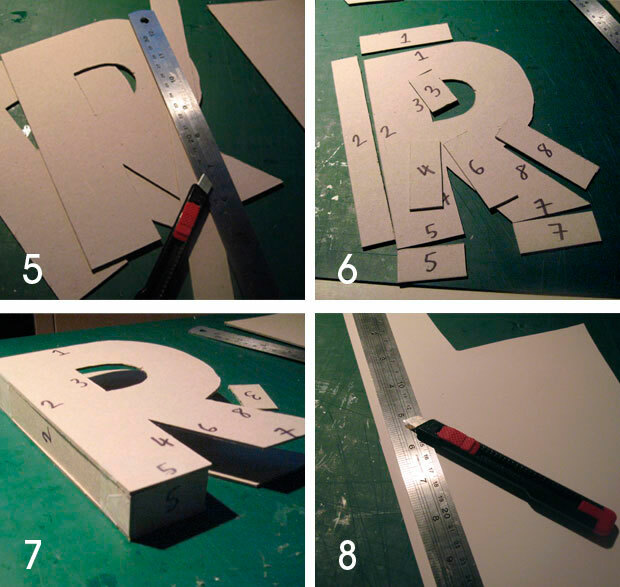 Use your tape to start sticking your letter together, with the strips sandwiched inside the cardboard letters. 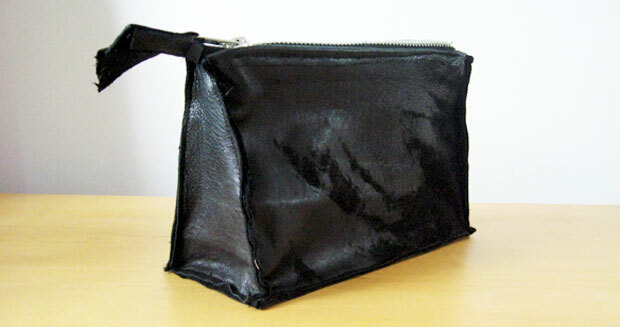 You can afford a little messiness, but any big lumps and bumps will show through the outer paper. It should now start to look like it’s coming together. 8. If you’re letter has any annoying curves, we cheat. Use your thin card to cut out a strip that’s slightly wider than your original width. 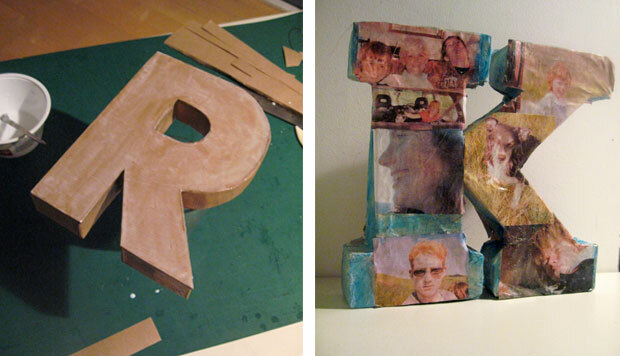 This time it’s going to sit around the edge of the 2 cardboard letters, as below. 9. Curve your thin card round and stick it to the letter. 10. Once its all looking solid, get your wallpaper paste or PVA and paste it all over one side of your letter take your coating paper and cover the letter, smooth out all the air bumps. Once it’s dried a bit, cut the corners of your paper. For the curved edges make little snips as indicated. 11. 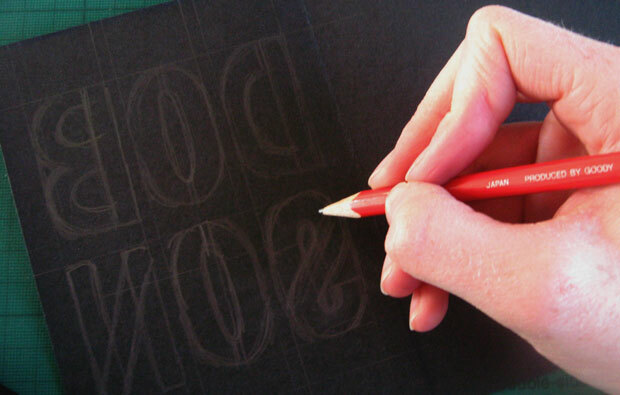 Paste around the edges of your letter and neatly smooth down the edges of your paper. You may want to smooth down the edges with your fingers to get them really smooth. Leave it to dry a bit and repeat steps 10. and 11. for the other side. 12. Cut some paper strips to the same width of your ruler. 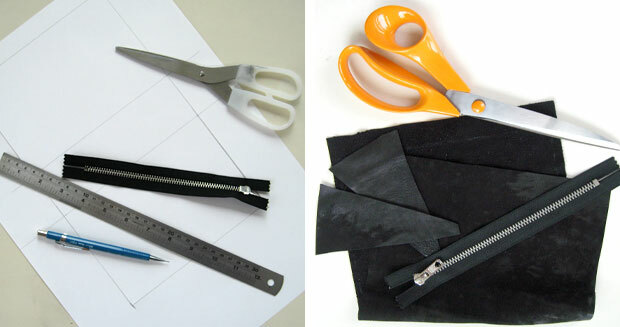 Once again paste round the edges of your letter and smooth the paper strips around the edges, cut off the excess paper. Leave it to dry. 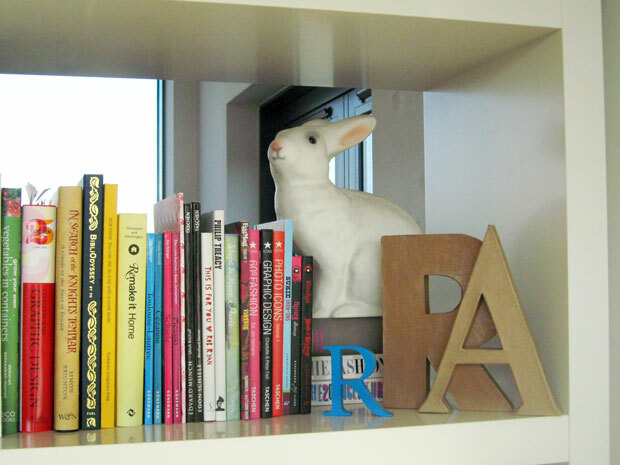 As you can see below, I coated my “R” with PVA to give it a shiny effect but it’s entirely up to you. As some inspiration the right image is a letter littlest brother (although he’s not really so little anymore) made me for Christmas. You really can do whatever you want and the results are great. Enjoy! As you know I’m pretty new to writing up diy posts, so if I’ve missed anything out, or you have any questions, let me know! 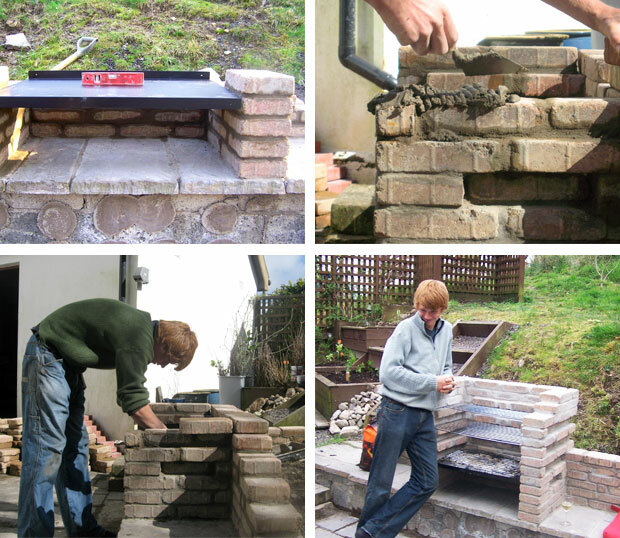 Ok so technically this isn’t a real diy, it’s just an idea for you if you’ve got a garden and are bored of buying a new cheap-o bbq every year. So it turns out middle-brother isn’t only good at windsurfing but is also a dab hand with bricks and mortar. 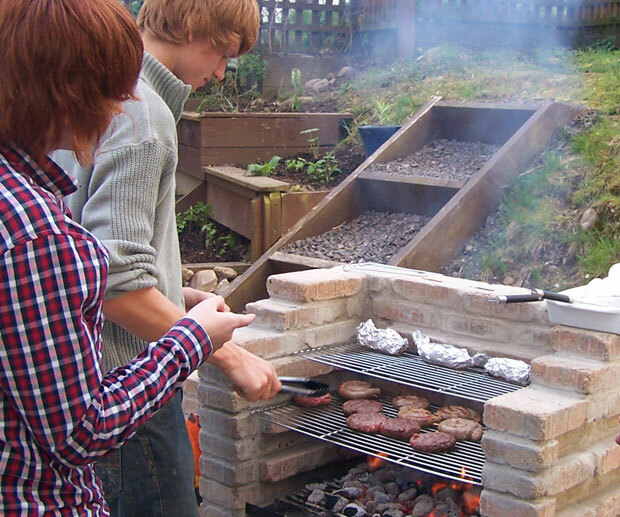 We got one of these bbq rack sets, some bricks, some mortar and some back garden.